In 1960, the Israel Diamond Exchange moved to Ramat Gan. In 1961, the Chairman of the Exchange, Avraham Lifshitz, and the Industry and Trade Minister, Pinchas Sapir, signed the foundation charter for the first building of the Exchange in Ramat Gan. In 1964, the cornerstone was laid, and the building was inaugurated in 1968. It was called the Shimshon Rozenblum building to honor the memory of the Vice President of the Diamond Exchange, who passed away shortly before the completion of the building. The Shimshon Building realized a unique concept: all services under one roof – trading hall, offices, inspection and customs authorities, banks, a post office, a restaurant, a medical facility, a synagogue and shops. In 1961, an agreement was signed between the government and industry representatives and the C.S.O. (De Beers’ Central Selling Organization), which established Israel’s standing as a direct supplier of rough diamonds. The Israeli diamond industry committed to buy rough diamonds from C.S.O for a total of £1 million per months on average. The C.S.O recognized Israel as an almost exclusive buyer of Melee diamonds, and promised to allocate Israel with five-sixths of all global sales of Melee. As a result, the Israeli diamond industry controlled the global Melee production. In 1965, the diamond company owned by Moshe Schnitzer, who served as Vice President of the Diamond Exchange at the time, was awarded “The Outstanding Exporter” prize by the state – the first time a diamond company won the award. In 1965, diamond factories were opened in Kiryat Gat and Netivot. In 1967, the Israeli Diamond Institute was founded. Its mission was to assist and promote the industry. The Israeli government, diamond industry organizations, banks and Israel’s organization of trade unions were united in furthering the interests of the diamond industry in various fields: research and technological development, marketing, advancement of professional training and security issues. In conjunction with the establishment of the Israeli Diamond Institute, “HaYahalom”, a magazine dedicated to the industry, was established. That same year, the Association of Diamond Manufactures in Israel and the Organization of Diamantaires in Israel merged. In 1967, Harry Oppenheimer, owner of the De Beers Company – the main supplier of rough diamonds to the industry – visited Israel for the first time. In 1968, a stamp bearing an image of a diamond was issued for the first time in Israel. It was the first stamp in a series of stamps dedicated to Israeli exporters. Its face value was 3 Israeli pounds. The picture on the stamp represented an Israeli product exported by air. Nearly 1.5 million stamps were sold. The stamp was discontinued in 1973. 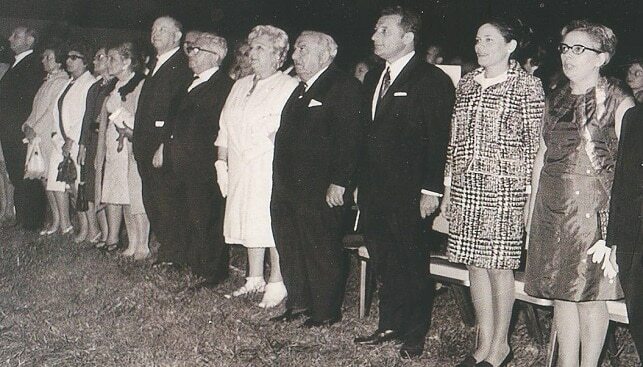 In 1968, Israel hosted the 15th World Diamond Congress. Moshe Schnitzer, President of the Israel Diamond Exchange, was elected President of the World Federation of Diamond Bourses (WFDB). It was the first time in the history of the diamond industry that an Israeli was elected to lead an international organization. In the sixties, the industrial diamond laboratory attached to the Technion – Israel Institute of Technology, in Haifa developed a new machine for polishing roundists which can polish the girdle of a diamond as a precise circular ring in the quality polishing area. The machine changed the character of the diamond production. The inventor of the machine was professor Yeshaya Yarnitsky from the Technion in Haifa. In October 1968, a new financing method was introduced, causing uproar among diamantaires. The financing of imports, production and stock converted to dollars. In spite of the industry’s general opposition to the change, they agreed to cooperate with the Ministry of Finance and the Bank of Israel. Financing of the industry in foreign currency remained. In 1968, there were 467 diamond polishing factories in Israel, employing approximately 11,000 people.